Eating disorder treatment is a safe haven for people who have struggled for years. Everyone who works in an eating disorder treatment center is trained in specialized communication skills for being trigger-sensitive. In the outside world, there is a severe lack of information and awareness when it comes to eating disorders. It is possible to find eating disorder sensitive medical doctors and form a team of like minded professionals for support after treatment. Hired Power can help you create a support system at home which continues to encourage your recovery. If you come across a doctor who is less informed, here are some steps to take. Living in recovery from an eating disorder means you have vibrant medical history. Eating disorders can have a large effect on physical health as well as mental health. Prolonged malnutrition, brittle bones, organ failure, and hormonal problems are part of your history. There is no need to be ashamed of being in recovery from an eating disorder. You are in recovery from an eating disorder, you are no longer actively struggling with an unmanaged eating disorder. Doctors, unfortunately, aren’t always attentive. They might focus on the eating disorder part more than the recovery part. Be empowered by your recovery. You can confidently tell your doctor about issues you’ve had in the past, but emphasize the health improvements you’ve made in recent years. Doctors see dozens of patients a day, each with a unique story, unique needs, and unique medical charts. Though they are doctors, they are still human beings and they are not perfect, which is why their personal offices are called practices. Medical doctors are not always well versed in psychological matters. When a doctor makes a comment about your weight as an indicator of your eating disorder recovery, it will be triggering, and it will be uncomfortable. 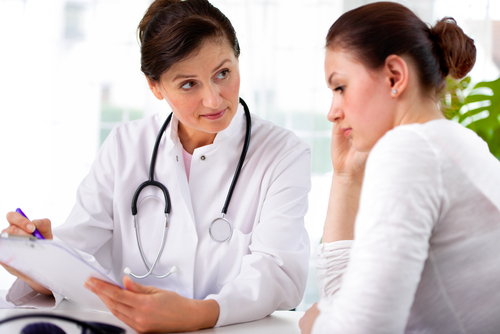 Take the opportunity to educate your doctor about how to interact with people who have eating disorders. There is no need for a doctor or the nursing staff to tell you your weight. For many people in recovery from an eating disorder, weight is a triggering piece of information. Doctors are sometimes too busy to take extra consideration for this. Instead, try communicating with the secretary or the nursing staff, and ask if a note can be put on your file not to discuss weight, because it could trigger a life threatening issue. Our goal at Hired Power is to help you bring recovery home. Aftercare planning can be overwhelming when you are focusing on getting home and continuing your recovery. From monitoring to recovery assistance, our services empower you to focus on recovery while we focus on your needs. For information, call us today at 800-910-9299.